No matter Spotify Free or Spotify Premium you are using, one common thing is that you can't download Spotify music as MP3. Sometimes, you may want to enjoy your favorite Spotify songs on iPod or an MP3 player, or you want to use the song as background music for your slideshow or DVD project. So you may consider using Spotify music recording software. Here we introduce 5 programs you can use to record Spotify Music as MP3 and the best one we recommend is a dedicated Spotify Music recorder which is called TuneMobie Spotify Music Converter you can download below. TuneMobie Spotify Music Converter is a dedicated Spotify recorder which can easily get your favorite Spotify songs, albums and playlists as MP3. When Spotify Music Converter is launched, Spotify application will be automatically launched as well. You can directly drag songs, albums or playlists from Spotify to this Spotify recording software, or copy link in Spotify and paste in the program. Then the program will record the songs played in Spotify in background and save as MP3, M4A, WAV or FLAC depending on your need. Once recording is started, it's an automatical process and songs will be automatically split by tracks. General speaking you don't have to click and click again to start and stop recording like other streaming music recorders. It's very convenient. Spotify Music Converter is available for Windows and Mac OS X, fully compatible with latest Windows and macOS Mojave. And you can enjoy 5X recording speed on Windows. 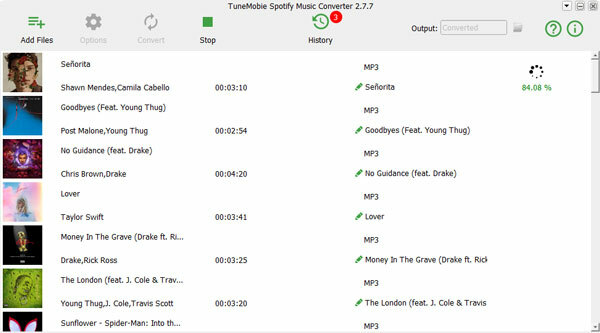 Working as a dedicated Spotify Music recorder, TuneMobie Spotify Music Recorder is much more convenient than other spotify recording software if you use Spotify frequently. Check the Pros & Cons below. 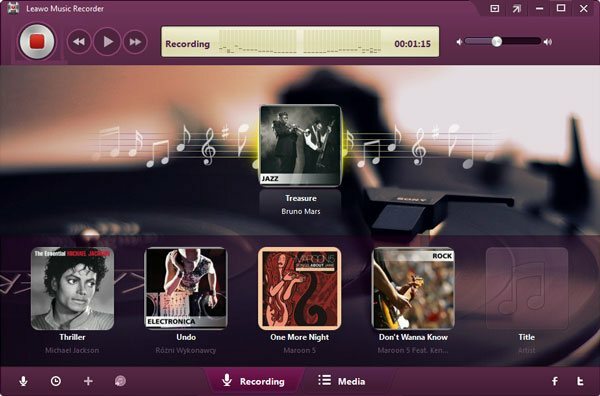 Leawo Music Recorder is a lightweight and easy-to-use music recorder developed by Leawo Software. It's used to record any local and online audio from system sound card and microphone. Streaming music services like Spotify can be also recorded as long as you are playing Spotify songs with application or web player. Leawo Music Recorder can save playing Spotify songs as MP3 or WAV, automatically split the tracks by setting a silence duration and automatically add ID3 tags to some songs. Apowersoft Streaming Audio Recorder, as its name suggests, it's mainly used to record streaming music from online websites like YouTube, last.fm and streaming music services like Spotify, Pandora and Apple Music, it can also record local songs from system sound card and microphone. Besides, Apowersoft Streaming Audio Recorder provides plenty of built-in radio stations from worldwide. MP3, WAV, AAC, OGG, WMA and FLAC are supported as output formats. Apowersoft Streaming Audio Recorder is a feature-rich audio program as it can also download online videos from YouTube and many websites and extract the audio, convert different video and audio formats to MP3, WAV, AAC, etc., edit ID3 tags with built-in tag editor, burn audio files to CD disc and rip tracks from Audio CD. The Cons are similar to Leawo Music Recorder which may make a user frustrated. 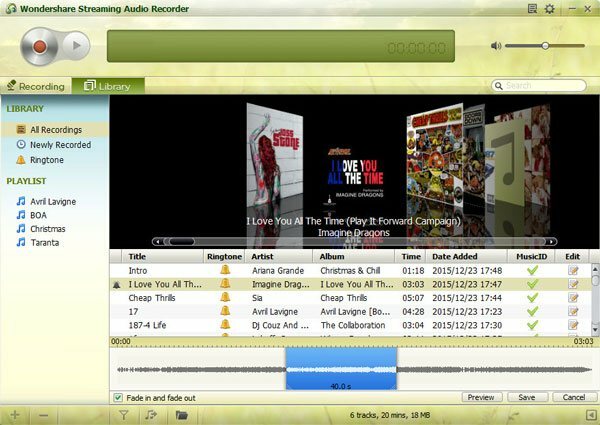 Wondershare Streaming Audio Recorder is another Spotify music recorder similar to Leawo Music Recorder and Apowersoft Streaming Audio Recorder introduced above. Wondershare Streaming Audio Recorder is not so powerful as Apowersoft Streaming Audio Recorder, but does better than Leawo Music Recorder. Wondershare Streaming Music Recorder can record Spotify songs as MP3 or M4A, allows you to manage the audio recordings easily, burn the audio recordings to CD as well as create iPhone ringtone from audio recordings. 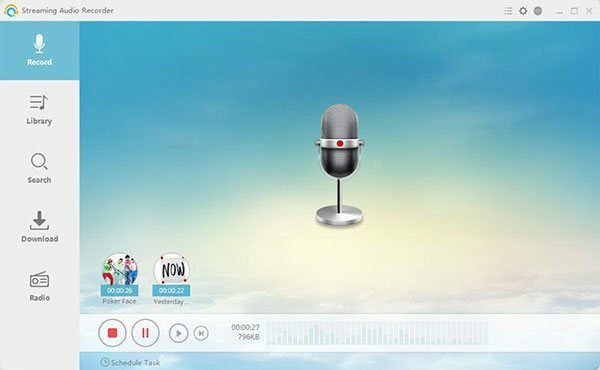 Wondershare Streaming Music Recorder also comes with automatic ID3 tagging, audio recording split and task schedule. As to the Cons, there is no difference. You need to install virtual sound card, edit ID3 tags when automatic tagging is not correct, manually record again when ads or two songs are recorded as one. Audacity is a combination of audio recorder and audio editor. It's totally free and developed by open source. Apart from Windows and Mac OS X, Audacity is also available on Linux. Audacity can record live audio through a microphone or mixer, or digitize recordings from other media. 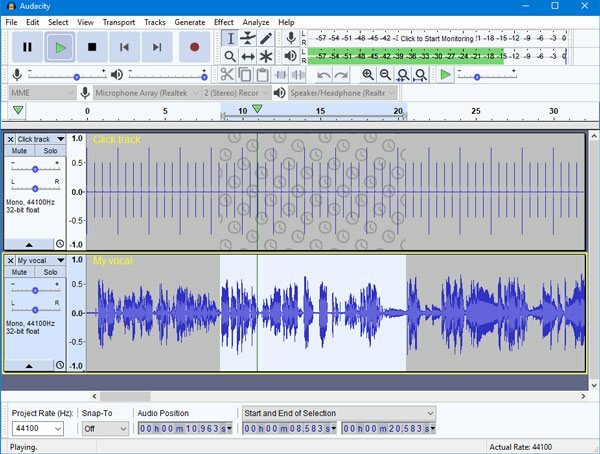 With some sound cards, and on any recent version of Windows, Audacity can also capture streaming audio. Audaticy can import and export WAV, AIFF, AU, FLAC and Ogg Vorbis files, with the optional FFmpeg library, you can also use Audaticy to import and export AC3, M4A/M4R (AAC) and WMA. With libmad, you can import MP2 and MP3 audio. With the optional LAME encoder library, exporting MP3 is also supported. Audaticy supports LADSPA, LV2, Nyquist, VST and Audio Unit effect plug-ins and allows you to preview LADSPA, LV2, VST and Audio Unit (macOS) effects in real time. Audio cutting is supported as well. TuneMobie Spotify Music Converter is the only Spotify music recording software you can use to record Spotify songs, albums or playlists in bulk without repeated operations, and it's also the only one which can help you preserve music information without manual editing. It's much more convenience and efficient than using other Spotify music recorder. The only disadvantage of TuneMobie Spotify Music Converter is that you need to use other audio recording software if you need to record Non-Spotify music. Want to record Spotify songs easily with high quality, automatic process, best efficiency and complete music information retained? Then do not hesitate to try TuneMobie Spotify Music Converter.